The 34th International CAE (Computer-Aided Engineering) Conference, held in Vicenza (Italy) 8-9 October 2018, has represented one of the principal annual events in Simulation-Based Engineering and Sciences, gathering all the most important international stakeholders from academia and industry to research and software vendors. In this framework, the GASVESSEL partners ESTECO and PNO have organised the first GASVESSEL themed Workshop, focusing on the implementation and validation of the tools developed by ESTECO: the Decision Support tool VOLTA and the Design Optimisation Platform modeFRONTIER. GASVESSEL partners have been largely using VOLTA as a multidisciplinary business process optimisation and simulation data management platform to optimise this novel CNG transportation concept and modeFRONTIER as a comprehensive solution for automation and optimisation engineering design process. 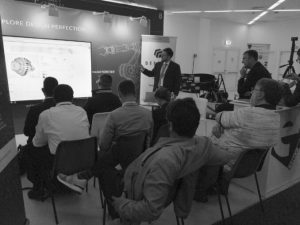 Once the main concepts being introduced, Alberto Clarich, Head of Engineering at ESTECO has presented how VOLTA has been used by the GASVESSEL partners to set up a process integration/optimisation workflow and share via web data and process results. Luca Battaglia, Service and Support Engineer at ESTECO, has performed the live-demonstration of how VOLTA has been used by the GASVESSEL partners. After the live demonstration, ESTECO engineers were available to answer questions and receive suggestions from the audience. The first themed exploitation workshop gave to the public the possibility to meet in person the partners of the project and to learn directly from the experts how the VOLTA software enabled the project partners to optimise the cost of CNG transport, providing ship designers with indications on the optimal speed, vessel and fleet size. ESTECO engineers performed a live demo of how VOLTA is used by GASVESSEL decision makers to share data, execute optimisation and analyse outcomes. Moreover, the workshop has represented an opportunity for the whole GASVESSEL project to receive feedback on VOLTA, an innovative tool that is supporting the consortium partners in the development of the project.